Today I am going to introduce you to a new online store named joybynature.com, which is a shopper's paradise if you are into organic and natural lifestyle products. At the end of the article, I have also shared a special 10% discount coupon only for the readers of this blog and other ways to win free online shopping at JoybyNature.com. With so many people awakening and moving close to Mother Nature, many new organic/natural brands and online stores have come up in the last one year. JoybyNature.com is one of them. Which is your current favorite online store for organic products? I remember my crazy excitement at discovering ecotokri.com, which was deflated when I tried shopping with them. I got a very rude reply that they don't deliver to my area on COD when I told them I only prepay for my orders. So recently when I came across joybynature.com, I jumped with joy. 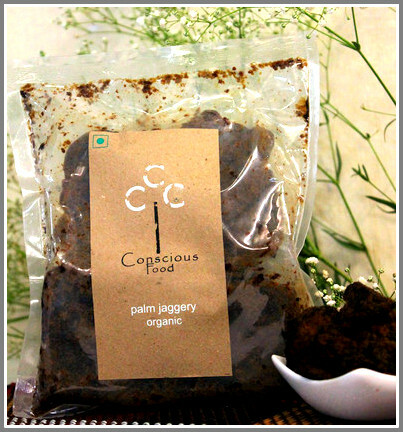 JoybyNature.com offers such a HUGE variety of healthy organic products that you will be spoilt for choice. You can check out for yourself. You will find all famous brands like Tvam Naturals, Shahnaaz Hussain, Iraya, Khadi, SOS Organics, Organic Therapie, Omved, Aryanveda, Auravedic, Rustic Art, Gloria Carcia, Aroma Magic, Avalon Organics, Alba Botanica, Jason Naturals, Vedic Line, Natural Bath and Body, Soulflower, Soultree, Unived, Himalaya, The Nature's Co, Pure Naturals etc. There are also organic brands I had not heard of before, but their products look very promising and good from the ingredients list. I have long been searching for a new brand of sulphates-free shampoo and found many on this site. Let's see if my search ends here. Has a natural chocolate taste and rich in Calcium and Minerals. Buy HERE. 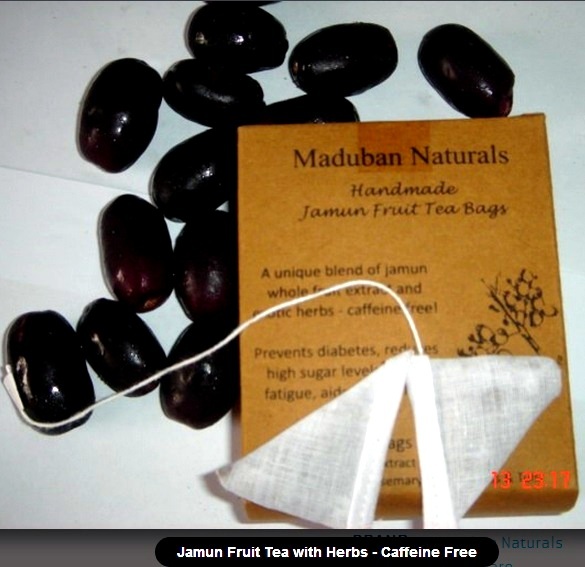 Each tea bag of Jamun Fruit Tea contains highly concentrated extract of whole Jamun fruit and organically grown herbs like Thyme/Rosemary/Lemon Grass/Mint/Tulsi. 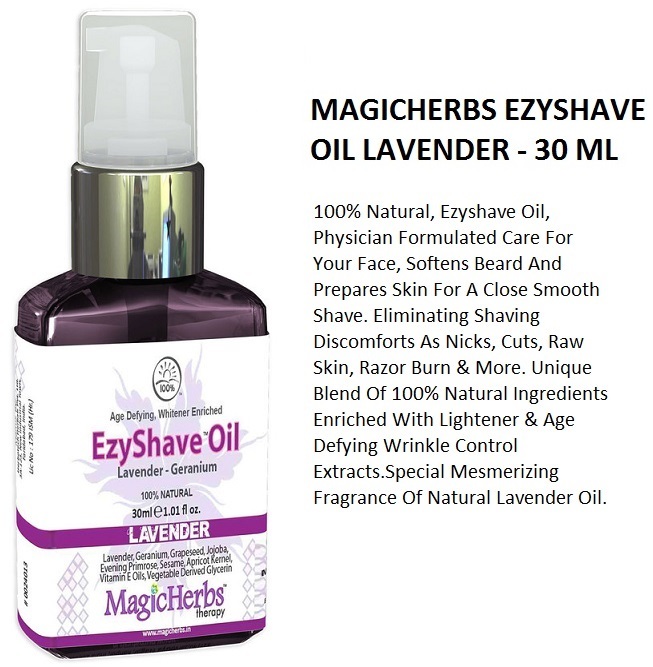 They sell organic grocery/food, organic and natural beauty products, organic baby care products, organic home care, spa, aromatherapy and home decor products, organic health and wellness products and even a small range of organic clothes for both men and women. 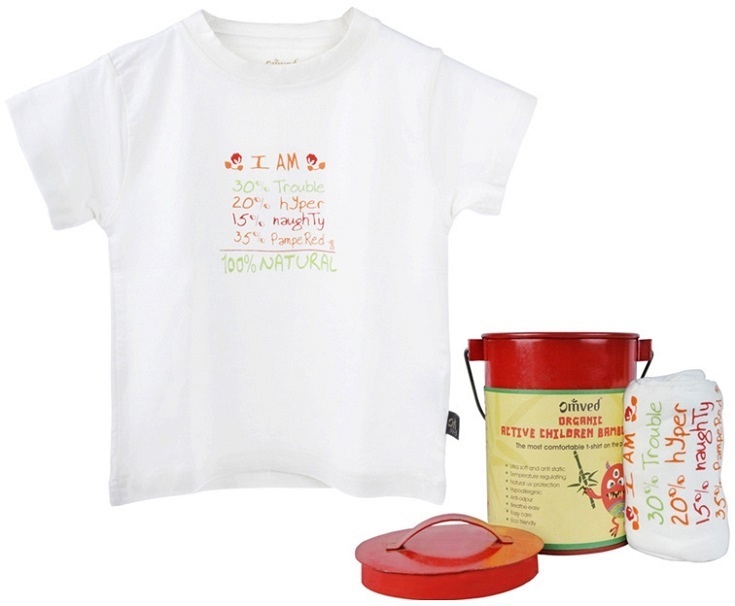 You can also find organic baby and kids clothes made from special natural bamboo and certified organic cotton, under the Baby Care section. Each section has further menus and sub menus for ease of browsing. Like under the Natural Beauty section, you can browse products for Hair Care, Skin Care, Bath and Body, Eye Care, Foot Care, Nail and Hand, Facial Kits, Essential Oils, Makeup, Body Firming. Under Beauty, there is also a specific section for Men offering products like organic After shave lotion, face washes, beard gels, hair colors etc. 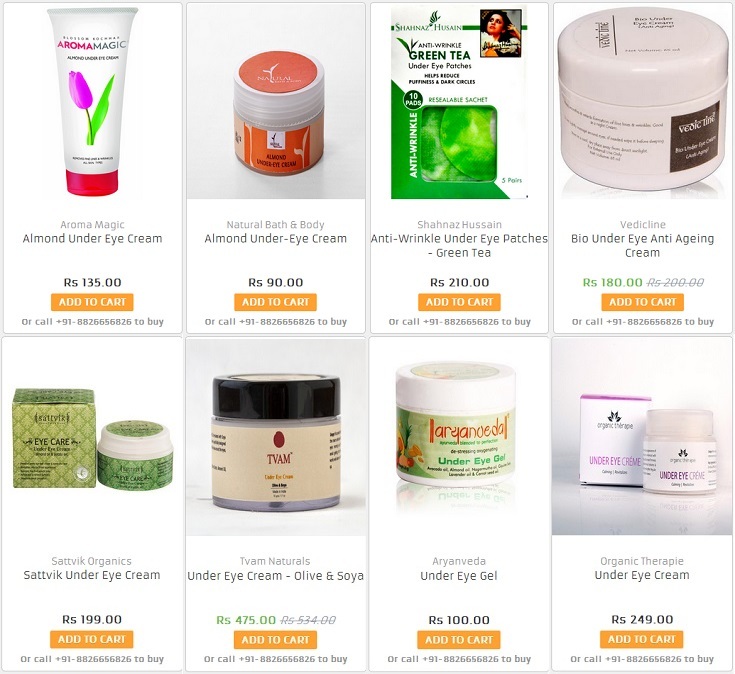 Acne, whitening, sun protection, stretch marks, blackheads, anti-ageing, cleansing, toning, firming, moisturizing, facial, natural makeup, under eye care, nail care, foot care, any skin solution you need, you will find numerous organic solution products all under one website. There are online stores with pages hoarded with images, way too many products and constantly throwing suggestions in your face, which at times I find mentally tiring and annoying. So I found the simple clutter-free product pages of joybynature.com to be a welcome change. I can enjoy a relaxingbrowsing experience. Each item has a proper description and ingredients list given wherever the brand has provided ingredients on the packaging. The search box on the home page works perfect, which is one of the most important features for me on any online store. I was able to find many interesting items through the search box, which I had missed while browsing through the menus. If you enter a brand name there, it pulls products specific to that brand only. An important feature currently missing in the site is the 'My Account' section for registered buyers, which you can access only when you log into the site. Also, I wish there was an 'Add to Wishlist' option for the items so you could shortlist them and buy them at your convenience. The 'Brands' drop down menu does not show all the brands, so you can either browse through the menus or use the search box on the home page to look for an item. The website really needs some good work for you to be able to locate all the products. For example, under Skin Care>> Eye Care>> There are a few great under eye creams which don't show up and I happened to discover them later. I have already shopped with them once. From order confirmation date, they took 2 days to dispatch my order as one of the items I had ordered went out of stock. They called me to inform and helped me modify my order before dispatch. They provide free shipping across India on orders above INR 499, which is less than/ at par with most other online stores. COD (Cash on delivery) is also available for most cities. They have tie-up with premium courier services like Blue Dart and Fedex. There is a 30-day return policy and the policy links are at the bottom of the home page. You can contact customer care at +91 8826656826 or at info@joybynature.com for any questions or to place an order on phone. They were easily contactable when I called them. What makes them stand out from other similar businesses is that they have a special section on the home page, dedicated to visitors/buyers, which is purely informational. They have shared : 1) Simple and Healthy Food Recipes. 2)Natural lifestyle which covers home remedies and articles on healthy living. 3) Ask an Expert Section (details later) and 4) Benefits of natural products. You can also contribute an article sharing a Recipe or a Natural Remedy or the benefit of a natural product and if your article is selected and published under these sections, you get a Rs 250 online shopping voucher to shop at joybynature.com. Isn't that cool? They have a panel of Naturopaths to give you access to expert advice on health and personal care for a nominal charge of Rs 100 per question. Currently you can ask questions on the phone or over email. Many of you share the same interest in organic and natural products as me and this store has so much to offer, you will surely be delighted. If you have already shopped with them, do share your experience. If you haven't yet, you can use discount coupon JBNHRLT10 to avail 10% discount on purchases made above Rs 499 at joybynature.com. This coupon code is valid only for prepaid orders and not valid on Cash on Delivery orders. This coupon code is valid for 1 month starting from 25th April 2014. I will share my haul pictures soon. JoyByNature.com keeps running exciting contests for its customers to win free shopping with them from time to time. Apart from winning shopping vouchers by sharing recipes, remedies and health benefits (as mentioned above), you can also win free online shopping vouchers for joybynature.com by participating in their Facebook Page contests. There is one running right now which is going to end today Apr 29, 2014. Do participate to win shopping vouchers for Rs 500, Rs 350 and Rs 250. Hey gagan...thanks for sharing this wonderful website...I just loved it!! Might order some stuff soon... Btw did you try any shampoo from this website?? I am thinking of ordering one of the sls free shampoos to give it a try...but most of them are quite expensive....thinking of ordering Aryanveda Lemon and tea tree shampoo...Which one would you suggest to try? Dear Jalpa, me too loved their products. There was one purenaturals color protect shampoo but this brand has exorbitant rates. 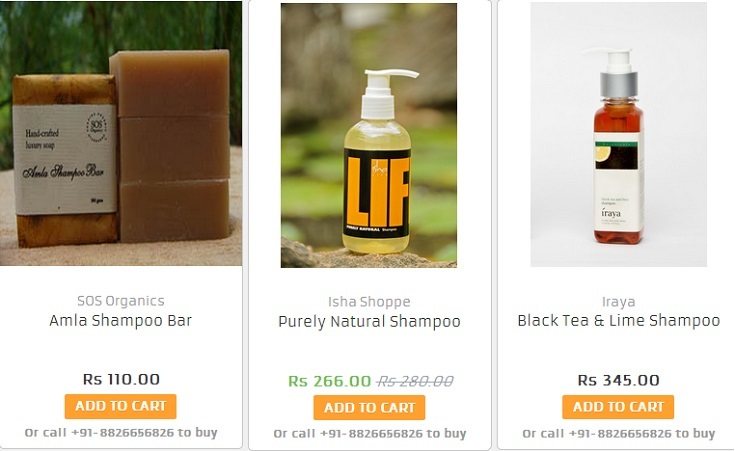 I have bought a variation of the Isha Shoppe shampoo you see in the pic above. The one I got is greenish blue neem amla henna shampoo. They have claimed it is SLS free but I am yet to check the label and all. Currently I am testing a new shampoo I bought for my son and may need to use that a couple more times before checking out this Isha Shoppe one. I have also narrowed down on the 'Natural bath and body' Volume Boost shampoo. Seems mild from the ingredient list though need to try. Both of these aren't costly. If you can wait for a week, I can check and tell about the one I bought. And yes, do make use of the coupon mentioned above and check out their facebook page, they are running contests almost daily and giving out gift vouchers too. I have one more update for you on the hair serum. Have made my own and works good as a styling serum. Haven't posted on the blog yet. You are welcome dear, I am glad you got a good shopping experience. I will surely share about the shampoo I have bought. Actually there is a German brand called Bubchen for kids. I got a Bubchen shampoo and body wash for my kid from Flipkart and was testing that shampoo. That's sulphates free and the results are amazing, but I need to test that a little further on the hair fall aspect. I will be reviewing that on my kids blog. I do have an open bottle of vedic line hair retarder right now but haven't used it in a very long time. Come summers and I am infested with painful hair follicle infections all over the body and waxing becomes a painful affair, my skin is very sensitive. So I apply aloe vera and other stuff and the hair retarder takes a back seat. But I have now kept it in front of me so I start using it again regularly. Jalpa they sent me another shampoo from the same brand and it was too much hassle to get it changed so I let it go, also the ingredients have crappy chemicals. It is NOT sulphates free, it is SLES based, so it is anyways a waste for me even if they had exchanged :( If you read this, do tell me about the shampoo you bought. Hi gagan, good to see this post.. like u, i am also on a constant hunt for sls/paraben free shampoos.. have found a couple of them recently and trying them out. 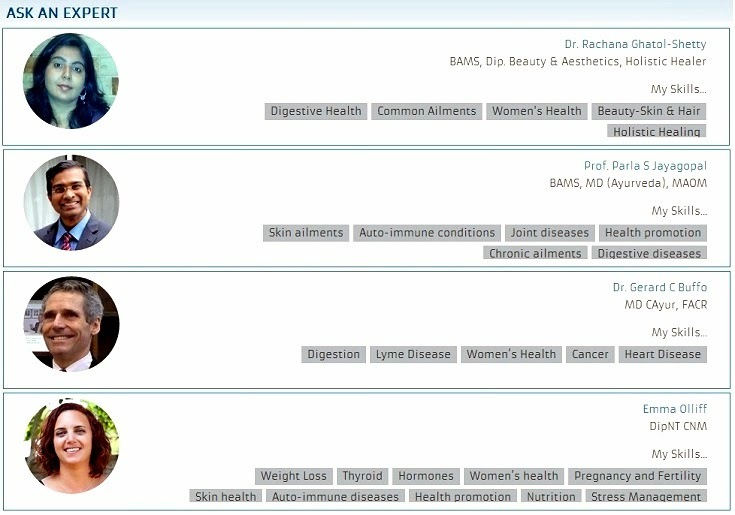 lets see if this website helps me broaden my horizon..
No dear I haven't bought from naturalmantra.com yet. I had checked it a long time ago and I think there was free shipping above INR 700 or more, which was probably why I had passed it at that time. I will go back and check. Thanks for reminding. They have reduced it to 499 which is I think is a good thing. Though I feel joybynature.com is offering wide range of products compared to naturalmantra.com. I just checked naturalmanta but could not browse properly. The drop down under each menu keeps disappearing when I try to move to a submenu with the mouse. Liked a few wooden toys. Rest of the items are similar but I agree JoybyNature has a wider variety when it comes to personal care. I love their food section, some varieties of chutney and teas are really nice. Ha ha ha ha that's nice :) Great you utilized the coupon code. I also bought something from the food section and the chutneys and Jamun tea shown in the article above are on my wishlist. Wow this site looks fab. i am a great fan of organic n natural products! shall definitely check it out! oooop i missed the contest. dont know why not getting ur updates recently! Yes the site has a lot of great products Megha but the shopping experience so far is very okay. They take at least 48 hours to ship the order after confirmation and every time some or the other item from the order is out of stock, so order needs to be modified every time. I hope they improve their services. This is Priyanka.. I ordered massage cream and I got unsealed one and it seems like used product very old stock too really I faced a bad experiences with this site .